Ever trying to explore %root\Program Files\Common Files\Microsoft Shared\web server extensions\60\Template\1033 (figure-1)? You will found where the magic of SharePoint template’s coming from. Every time you create new site in SharePoint, you must define which site style you’re going to make, and every site style has predefined template in these directories. 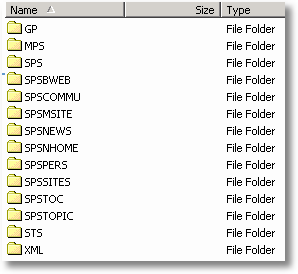 For example, if you make News site, then the corresponding template directory will be SPSNEWS etc. And you guess what? If you want to play with ListView toolbar in all hosted sites, then you must search and edit all .XML schema which holds the definition of the listview. Fortunately, the stylesheet can come to help and will resolve your situation in less than a minute. SCHEMA.XML, which is defined in any list template definition (figure-2), is responsible for list behaviors. This is the file where SDK suggest to modify when you don’t want “Edit in Datasheet” appear in list view. In SCHEMA.XML you can found the definition that will solve your problem (figure-3). Of course if you delete this part, then your problem is gone, but only for a list in a site style. If your situation persists and you must remove “Edit in Datasheet” from all list view in your site, then the problem begins. Examine again the SCHEMA.XML part (figure-3). The suggested part is implementing “ms-toolbar” class with “diidEditInGridButton” id. Creating new CSS class for this part won’t resolve the problem, because you still have to replace all occurrences of “ms-toolbar” in “diidEditInGridButton” part. Then, we must have other approach the “CSS index selector”. Index selector in CSS works by matching HTML component ID with style name definition. In order to make CSS works in such way, the style name must be same with desired ID name and prefixed with “#”. Put listing-3 in %root\Program Files\Common Files\Microsoft Shared\web server extensions\60\TEMPLATE\LAYOUTS\1033\STYLES\Ows.css to make it available throughout your site’s list view or include it into any of your custom list view to make it available only for single list view. Even a CSS can make our job easier than editing whole .XML. And the same concept can be done for any other component in SharePoint.